Something I just read in a fellow blogger's post has set me thinking...........Who/what do I blog for? For myself? For others?? For time-pass??? For professional reasons???? I thought........and I thought.............and then I thought some more.........and I arrived to the conclusion that I do blog for myself & myself only! Of course, I like expressing myself through my blog & sharing that expression with so many other wonderful souls around the world.........but I'd have blogged anyways even if nobody else cared tuppence about my posts or my outfits. Ok..........now that I've bored you guys with such a long speech........here's a few pictures of a latest outfit. I wore this while going for a designer friend's Fashion Show at a 5-star hotel........it was so hot that I decided to dress lightly & casually for the event. 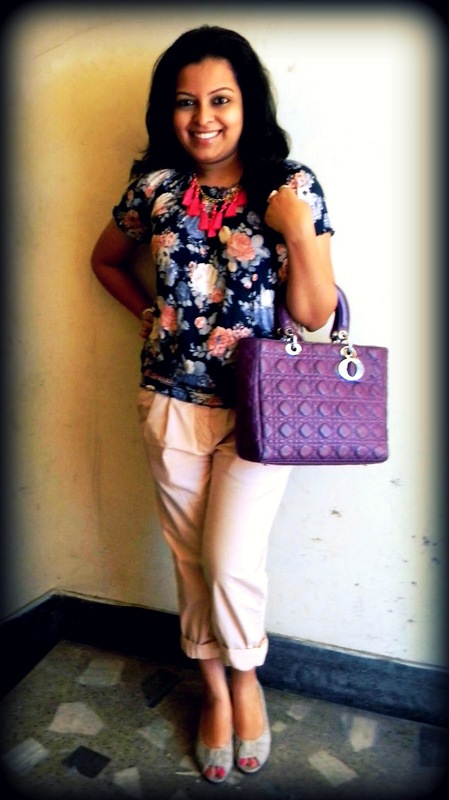 This floral blouse is borrowed from my sis..........and I felt jubilant at being able to fit into a Size S!!! And here's a tasseled beauty from Howrah Bridge's SS '12 collection.........go check out the other designs NOW!!! Find brands like Zara with coupon discounts at Buy.com! I adore this outfit! 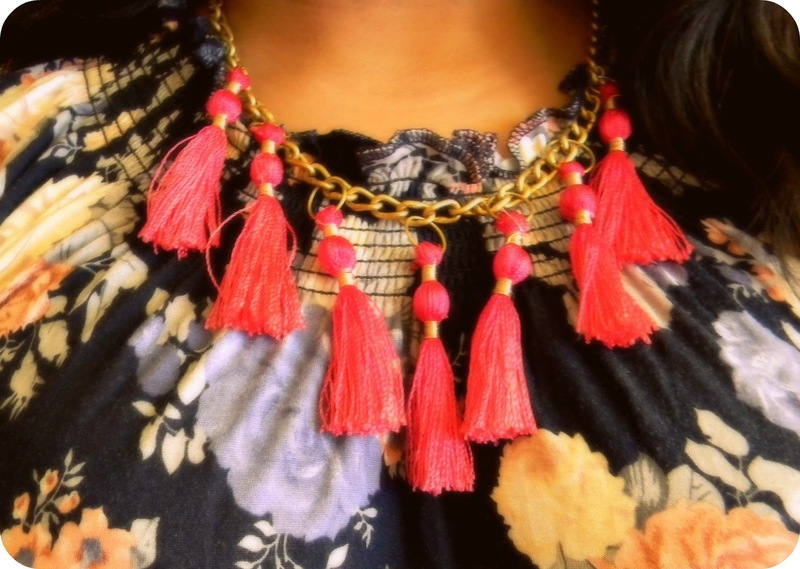 The blouse is adorable and the pants fit you perfectly :) Your necklace is really pretty too! you look very cute, nice outfit!! most of the bloggers i have met and conversed with have expressed the same thing about blogging - at the end of the day, its all about self expression!! I like your look here, very summery, a serene summery look...and ofcourse i did not miss your necklace..pretty!!! As a fellow blogger, the most important thing about blogging is just to express yourself in your own way. Share whatever you want to share. Don't let anyone tell you otherwise. I do hope you're doing well as I do enjoy coming onto "Chappals vs Stilletoes." Calcutta has gotten so hot these days! I love the florals and the peep toes too! 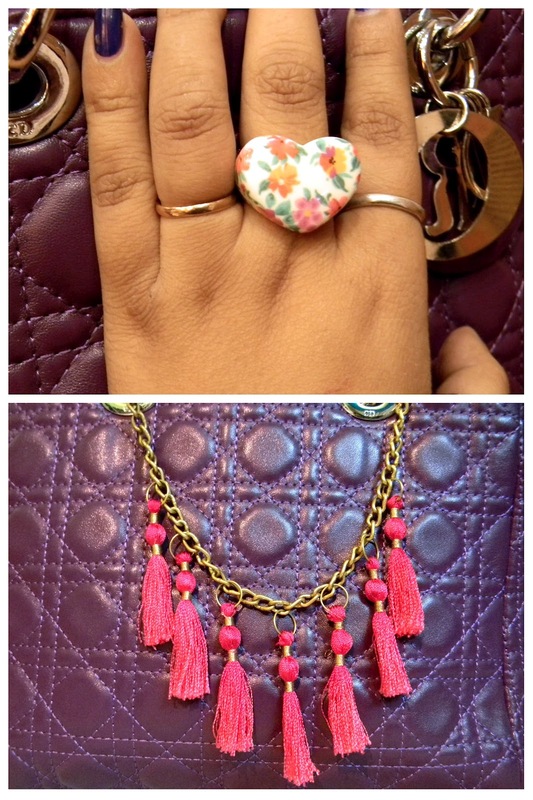 A very bright and cheerful outfit!! 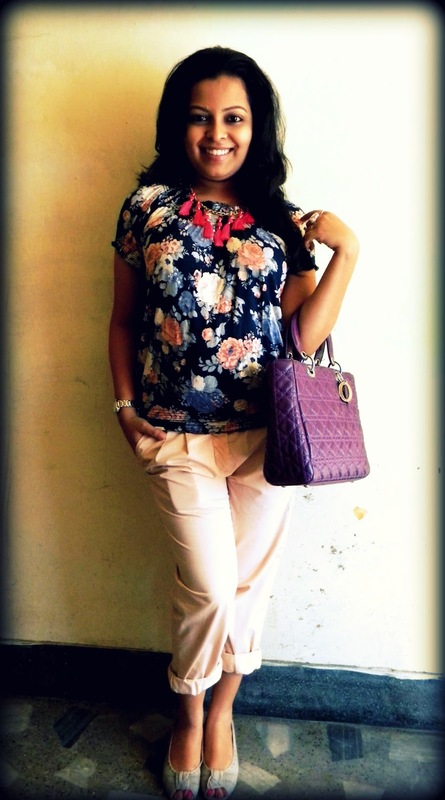 Love how the colors of the floral top bring the bag and pants together!! Again, very cute outfit!! I love the necklace against the floral top! And those pants are fantastic. 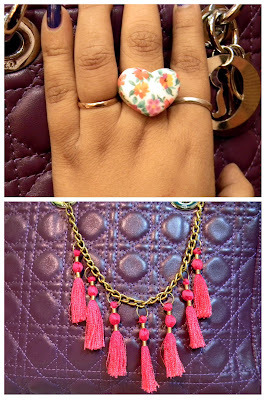 cute outfit, love your bag and necklace! Hello miss not so dedicated blogger :)...loved this zara pant and howrah bridge necklace...its so cool and you are looking cute ! I love your necklace and the top! A good question and a great post! Stumbled onto your blog for the first time today. Also, hold those pants close, it's VERY hard to find a fit as great as that! Those are some neat looking pants. Also liking your photos.. very well done. Just came to know that one pair of jeans consumes a whopping 3000 liters of water during its lifetime starting from the cotton production stage to manufacturing process all the way till you throw them away… that’s a lot of water! I love the look especially your top and the ring! florals are so pretty on you! I love all these outfits!! you can find latest printed party wear kurtis from G3 fashions surat.